Spam or Junk emails are often classed as unsolicited emails which may focus on advertising and selling goods or services. You may have never signed up for these emails in the first place. A large number of Spam or Junk emails may be received in a small time frame. Phishing emails are messages which often contain false links or attachments designed to fool the recipient into opening and disclosing personal information. The sender of these emails can then use your identity for illegitimate purposes. Do not open the contents of any attachments or click any links. 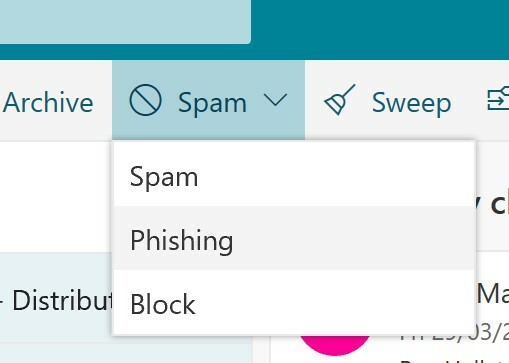 Select the appropriate option depending on whether the email is Spam or Phishing. If you’re in the scenario where either of the the above two methods are unavailable, the University has provided an email address which you can forward suspicious emails to. This is can be useful if you use another email client or the Outlook Mobile App. To use this, simply forward the suspicious email to reportspam@chi.ac.uk.